One industry in particular that has taken a liking to the iPad is the finance industry. iPad Apps for the finance industry is a rapidly growing area of iPad development. Many companies have been creating iPad apps that connect consumers to the finance industry. But iPad Apps for the finance industry are not just consumer oriented. Companies are rapidly hiring iPad developers to design iPad apps for intracompany use. A technology company that provides mobile solutions for more than 4000 enterprises recently analyzed their sales data and found more than 36% of its iPad activations have come from the finance industry. Meaning that iPad app development for the finance industry is sure to be a rapidly growing field. With iPad Apps for the finance industry becoming a bigger and bigger market, the quality of a finance institution’s iPad app could influence the business it does not only with consumers, but also influence the business it does within its own company. Companies in the finance industry need to take note of this. When looking to have iPad Apps for the finance industry developed it is crucial that the right iPad development team is selected. The iPad development company selected not only has to have knowledge of iPad application development, but also knowledge of the finance industry. 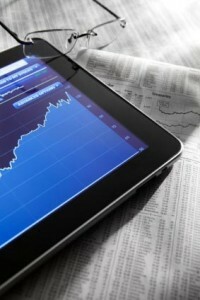 With the future of the iPad brighter than ever, who knows what the finance industry can expect to see from iPad apps. Maybe one day the iPad will replace the heavy and out dated tablet computers used on trading floors such as the NYMEX, NYSE, CEM, and CBOT. Maybe someday brokerage houses will be able to offer their clients iPad trading apps that provide content as dynamic and fast as what is today only available for desktop computers. The possibilities of iPad Apps for the finance industry are, at this point, virtually unlimited. Having had much experience in the finance industry, and the iPad development business, EcomSolutions is a company well positioned to develop iPad Apps for the finance industry.